A delicious recipe from a Women’s Weekly I borrowed at the library some time ago. Perfect for this kind of weather (we are talking Southern hemisphere here!). This ITALIAN BRAISED PORK requires long cooking, so make sure you give yourself plenty of time. And it may look like a “big” recipe, but it’s very easy to make. I forgot to take a photo of the pork in the pot, so this is a deconstructed version of it, starting with the saucy bit. Heat oil in large flameproof casserole dish on stove top; cook pork until browned all over. Meanwhile, combine ingredients for spice rub in small bowl. 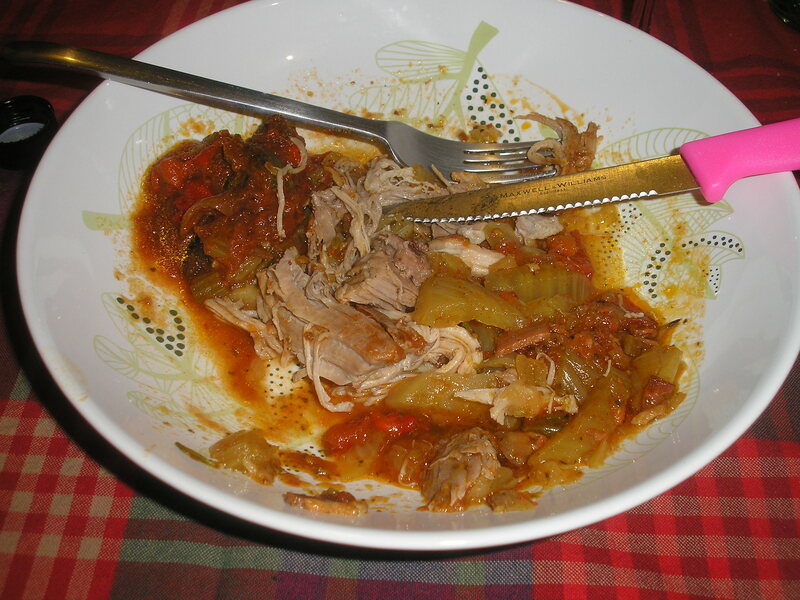 Remove pork from dish; discard all but 1 tablespoon of the oil in dish. Cook garlic, onion, chopped fennel and pancetta in same heated dish, stirring until onion softens. Add paste; cook, stirring , 2 minutes. Meanwhile, rub pork with spice rub. 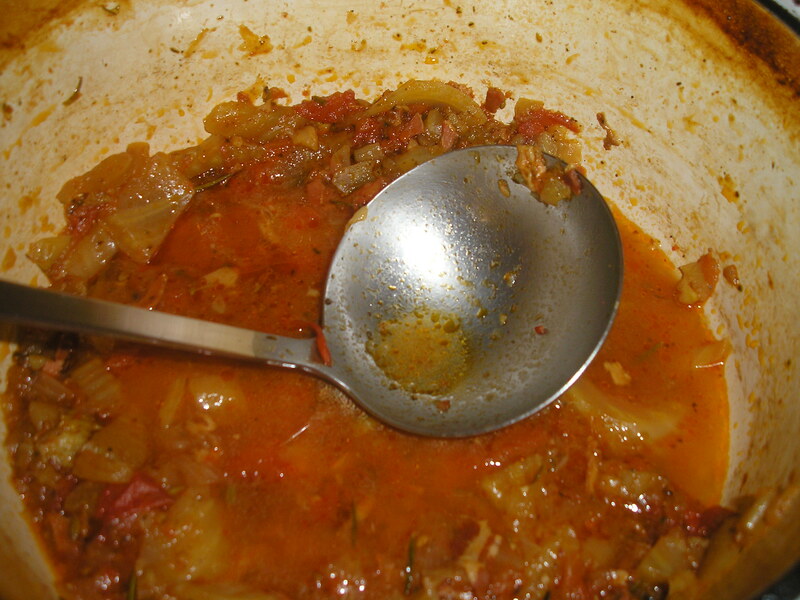 Return pork to dish with wine, undrained tomatoes, stock, the water and rosemary; bring to the boil. Cover, transfer to oven; cook 1 hour. Add sliced fennel to dish; cook, covered, in oven 1 hour. 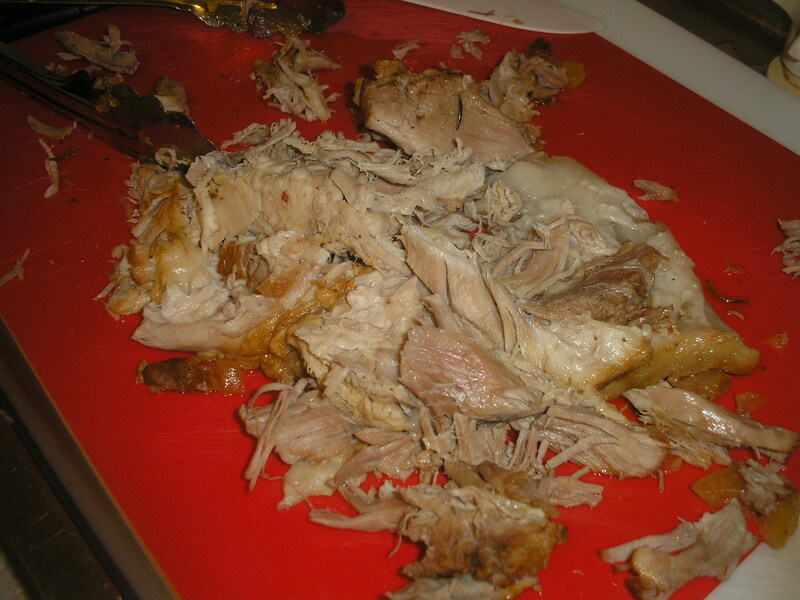 Remove pork from dish; discard rind. Cover pork to keep warm. Meanwhile, cook braising liquid in dish over medium heat on stove top, uncovered, until thickened slightly. Return sliced pork to dish; serve pork with sauce. First make sure you have a very big casserole dish so the pork will fit in it nicely with the lid on. You may need to add a bit of extra oil in the casserole dish when you start cooking the onion/ garlic/ fennel and pancetta. I put a piece of baking paper under the lid and over the pork, so the meat wouldn’t stick to the lid (because the piece of pork I had was more than 1.5kg). I followed the cooking time to step 7 and then cooked the pork for another 2-3 hours, so the meat was very tender. Keep checking every so often so that the amount of liquid is enough. I didn’t have to reduce the sauce at the end, it was just the right consistency. I served it with a ratatouille and ciabatta bread on the side. I also reduced the amount of salt in the rub to 3 teaspoons and had about the same amount of ground pepper (I have made this recipe before and to me it was a bit too salty).